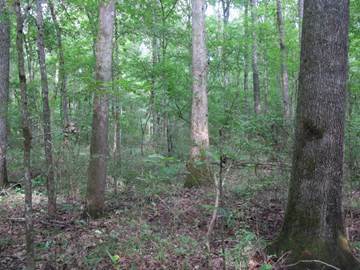 Bottomland and swamp forest cover types occupy a relatively small percentage of the forested area in the south. In North Carolina they occur on 13% of the state. They are rich in ecological, cultural, and commercial benefits. These benefits include protection and maintenance of water quality, floodwater storage, wildlife habitat for a variety of species, visual and recreational values, and various forest products obtained from the diversity of tree species present in these forest stands. Many of these forests were cutover in the late 1800’s and early 1900’s. The forests we see today are the result of these, and subsequent, harvests. In more recent times, many of these forests have been converted to other uses, such as agriculture, due to their productive soils. Federal and state wetlands regulations have slowed these conversions. In addition, changes to the drainages astride which many of these areas lie has altered the hydrology on which these forests depend. Some of these changes are the result of upstream impoundments while others are the consequence of downstream impediments to flow. In either case, the outcome often brings about challenges regenerating these forests or causes forests of different, often undesirable, species to form. The forest cover types contained within this group take in both riverine and non-riverine systems. The riverine systems may be either red river (originating in the mountains and piedmont) or black river systems (originating in the coastal plain). The non-riverine systems are comprised of pocosins, Carolina Bays, upland depressions, and areas within broad flats between widely spaced drainages. Examples of the specific forest cover types present on these landforms include those dominated by Cypress and tupelo, mixed species of bottomland oaks and their associates, Atlantic White Cedar, and mixtures of various hardwood species such as sugarberry, American elm, shagbark hickory, sweetbay magnolia, the wetland ash species, and others. Oftentimes these stands are harvested at an older age than other forest types because of growth rate of the species present and other factors. Many of these stands may be 60 - 80 years old or greater at the time of harvest. In addition, these forests experience few, if any, other forestry treatments during the time between regeneration and harvest. This infrequent harvest schedule or change in appearance, and the fact that these stands may be viewed from water bodies commonly used by the public for recreation, often lead to public concern when these stands are cut. Recently, the emergence of biomass as a source of fuel for power plants and other uses has increased public concern about the utilization and subsequent regeneration of these forests. Traditionally, most of these forests have been regenerated utilizing natural regeneration from seed and stump sprouting, or coppice. This has been adequate in many cases as long as hydrology and other site factors remained unchanged. However, on altered sites natural regeneration may lead to undesirable species or lack of regeneration in some cases. It may be necessary to practice some form of artificial regeneration such as planting of seedlings to establish the more desirable species in these situations. 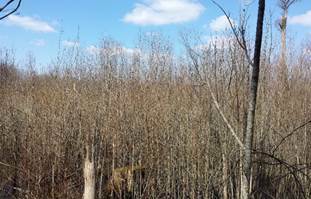 Today, foresters and others continue to expand their knowledge concerning the ecology of bottomland and swamp forests in an effort to insure sustainable management of these resources. 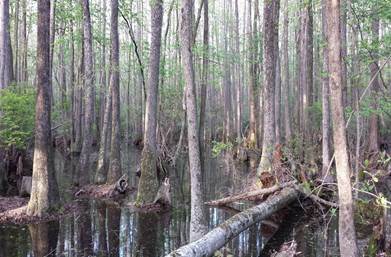 Contact your county forest ranger if you want more information about bottomland and swamp forests.